War of the Spanish Succession (1701-1714) - The Habsburg Dynasty reached its height in the 15th and 16th centuries; but by the late 17th century, it was in decline. Charles II was the last Habsburg monarch of Spain and he died in 1700 without an heir, male or female. A monarchy with no heir is a recipe for war. And just as the name implies, the War of the Spanish Succession was fought to determine who would rule after Charles. What it does not imply is that most of Western Europe was dragged into the fray. It began when Charles named his grand-nephew, Philip, Duke of Anjou to succeed him in his will. Philip was a Habsburg through his grandmother, Maria Theresa of Spain. Maria Theresa had been the wife of Louis XIV of France. Therefore, Philip of Anjou was also King Louis' grandson. So this development pleased Louis tremendously because it afforded him the opportunity to potentially add Spain (and perhaps its colonies) to his own empire. Louis XIV was already one of the most powerful kings in Europe (if not the most powerful). Naturally this alarmed France's neighbors. Within months, England and Emperor Leopold I of the Holy Roman Empire (as well as a few other states) formed an alliance against Louis XIV. Leopold was himself a Habsburg and felt he had as much right to Spain as anyone. The first military action began when King Louis sent French troops into the Spanish Netherlands to both secure the territory and to buffer against the Dutch Republic which had aligned itself with England and Emperor Leopold. In addition, he secured a trade agreement with Spain in an effort to strengthen economic ties between the two countries, while at the same time weaken the economies of other maritime powers. In England, there was some indecision within Parliament over how to confront France. 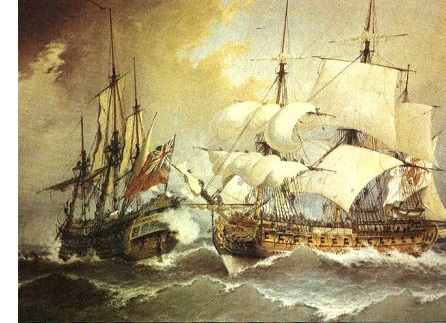 Some wanted a war of attrition by relying on the navy to blockade French ports and disrupt trade. They argued that France's army was too powerful to engage directly and doing so would be too costly in men and material. Others felt that France could not be defeated without direct confrontation. In the end, England settled on a combined strategy, relying primarily on its navy, but striking on the continent when the opportunity arose. Despite the powers aligned against it, early on, France looked poised to win an impressive victory. The allies' efforts were coming up short. 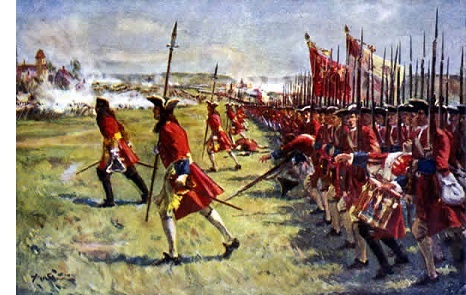 But in 1704 at the Battle of Blenheim, France's fortunes turned. Most of the German states had sided with Leopold with the exception of Bavaria. A combined French-Bavarian army tried to knock Leopold out of the war by capturing Vienna (another attack on Vienna). John Churchill, the English Duke of Marlborough, realized the danger and marched his forces 250 miles (400 km), from the Low Countries (present-day Benelux) to Vienna to help defend the city. His effort was the difference in the battle and helped preserve the alliance. The loss was a tremendous blow to the psyche of King Louis, who had considered his army virtually unbeatable. Whatsmore, for the rest of the conflict, France was essentially forced to fight a defensive war. Two years later the next key battle was fought at Ramillies. The war was draining France's resources and Louis was looking to make peace, but on favorable terms. The Battle of Ramillies ended much hope of that. The French army was routed with the Duke of Marlborough once again playing a decisive role. The loss proved costly to France in terms of territory as it had to abandon most of the Spanish Netherlands. A few months later to the south, Prince Eugene of Savoy broke a siege by a combined Franco-Spanish army at Turin, marking 1706 as the worst year of the war for France. The final decisive battle of the war was Malplaquet, fought on September 11, 1708. It was essentially a draw with the allies losing almost twice as many men, but holding the field. In this battle, both the Duke of Marlborough and Prince of Savoy teamed up to lead the allied forces. The Battle of Malplaquet was important more for its political ramifications than its military consequences. The huge loss of life had convinced both sides to seek peace. But peace often comes slowly. France and England didn't agree to stop fighting each other until October, 1711. And it wasn't made official until 1713 with the signing of the Treaty of Utrecht. Hostilities ended between France and Austria the following year with the Treaty of Rastatt. When it was all said and done, the man named to succeed Charles II ended up king afterall. He became Philip V of Spain with his reign officially starting in 1700, before the war began. However, the Peace of Utrecht established that France and Spain could not unite, and Louis XIV died in 1715 anyway, ending any possibility of that happening.